A Painterly Recreation for Aaron & Christina — Paper Rose Co. Earlier this summer I worked on what is quite possibly my most vivid, and definitely my most enhanced wedding bouquet recreation yet. I'm not sure that one single petal went into this piece without being painted, inked, or hand-detailed in some way. The labor was intense, but the results were insanely beautiful. Let's dig in! Luckily, Aaron was able to share several photos of his gorgeous bride holding her flowers so I could get a comprehensive look at all what it contained form lots of angles. For me, the best part of making these anniversary gifts is to see how close I can get to what the bride remembers of her bouquet—which chances are, has a lot to do with these photos. From the email Aaron sent, it sounds like I succeeded! 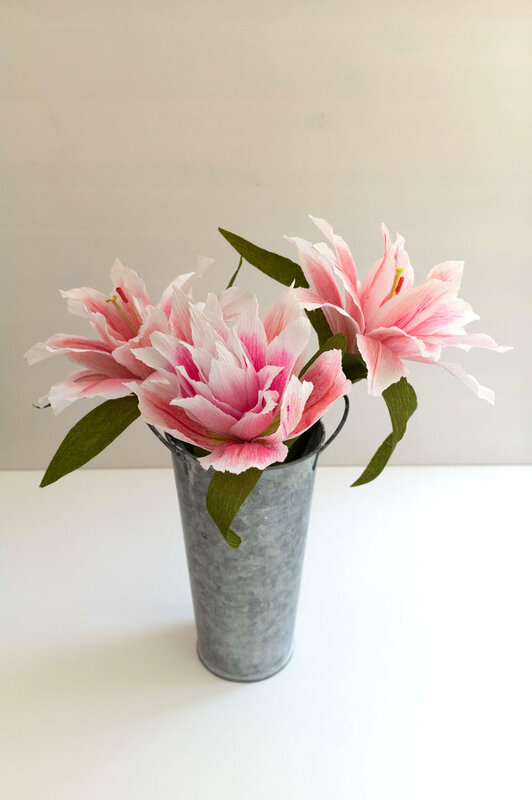 Similar in tone to the lilies were a new-to-me variety of rose—which I also researched and found to be called the Malibu Rose, an ivory petaled rose with bright pink tips—and big fluffy peonies. And to bring in a little bit of the pink tones, I added just the slightest hint of a rose tone along the edges of the hydrangea petals. 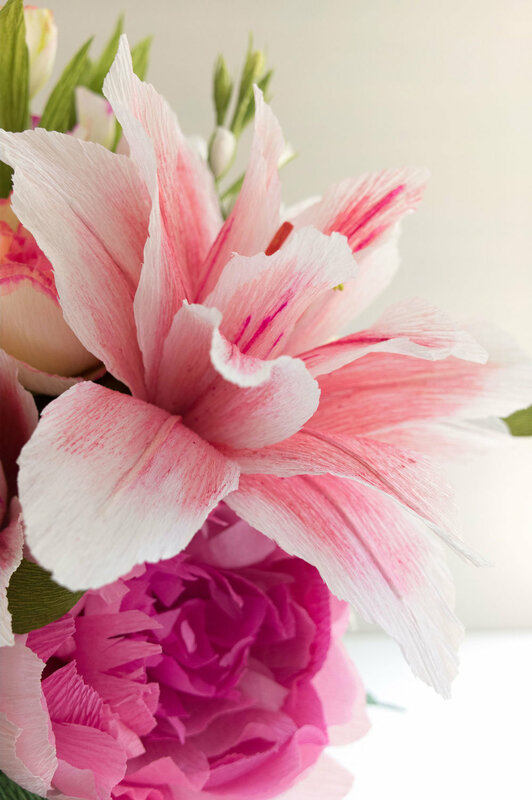 As if these blooms weren't already enough, the filler flowers and foliage commanded equal attention. (So much so, I thought they were worthy of a separate post.) And in case you missed it, I documented my process for creating alstroemeria a little while back here—templates I was happy I had to refer to again! 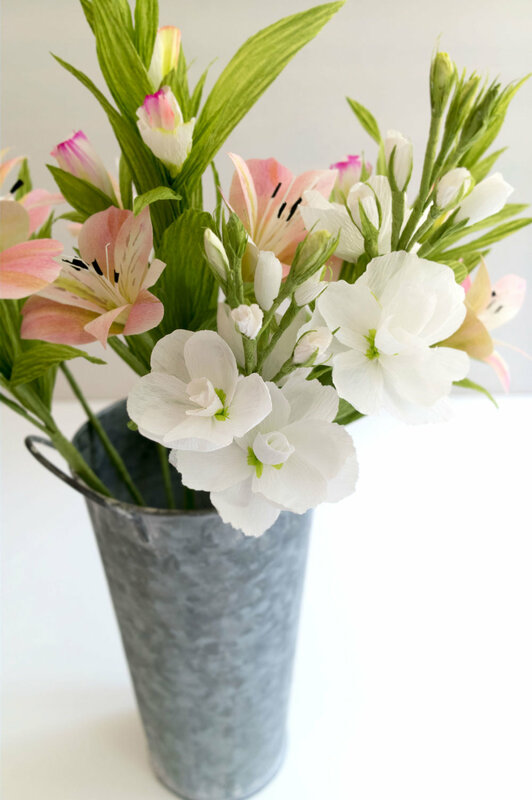 The white stock and spring green and pink Alstroemeria stems—while often overlooked by traditional florist—add lots of movement, interest, and freshness. Well worth the investment for this bouquet! I was lucky enough to have a few extra minutes to shoot this project at the time of day when the sun was hitting my studio window just right, so I threw in a dark background to show off some detail in all of those pretty painted petals. I'm usually rushing to take these photos so I can make sure orders get out on time, so when things work out I'm a happy camper! There are so many fun pieces in this one—it's hard to pick a favorite. Which one is yours? And what do you prefer, the dark, moody shots or my usual bright and minimalistic ones? Or both? Let me know in the comments or send me a note! a Custom Design or a Paperversary bouquet this holiday season, be sure to plan ahead!